Too bad about the differences. I remember those lights, but didn't realize they actually had a distinct visual impact, otherwise I would have kept them when removing the big box. No idea about the switch sound. I kind of lost track of things after a while to be honest, because I made all fixes in Trenchbroom (which I'm not used to) since Radiant would mess up some of the terrain, as well as a text editor. It was more of quick test at first and only then I decided to fix some of the other issues too. This map is interesting in terms of how there are two different routes, and lots of secrets. Although I think some of them are a bit too random/hard to find, especially the gold key which is very hit and miss. Even after realizing how to get to the area where it is, it's still awkward to pull it off due to how the mechanics are designed. For next time, try to improve on vis blocking (avoiding overly long sight lines), colored lighting (needs subtlety, it's all over the place here), and general technical polish. Also, get beta testers. Anyway, thanks for hosting the map! I had quite a bit of fun making it, but seeing OTHER people enjoy it was the greatest reward I could hope to reap from this experience. Thanks again! 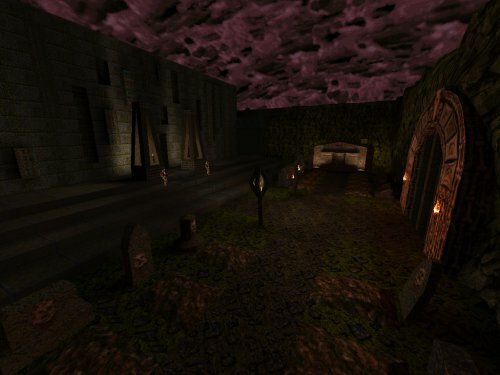 Yet another new level added to the Quaddicted database: Temple of Quake by Esrael. The author's first release. A small to medium-sized runic-style temple with a graveyard in rocky surroundings. The level can be finished fairly quickly, but in order to visit all areas and get better equipment it requires exploration and secret-hunting which adds a degree of replayability.